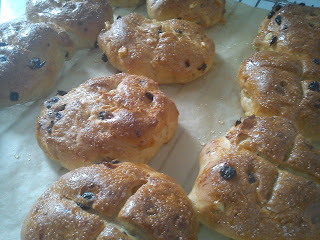 Today it is Easter Sunday, and after making Easter eggs Good Friday, we will be baking English-style Hot Cross Buns today. 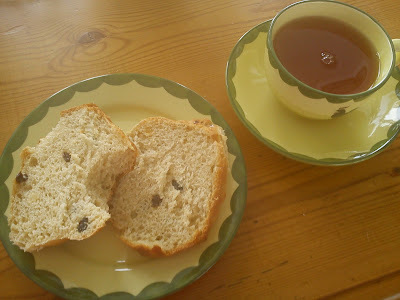 I have located this recipe in a Danish magazine some years, and I have no idea, if they identical to Hot Cross buns made in England. 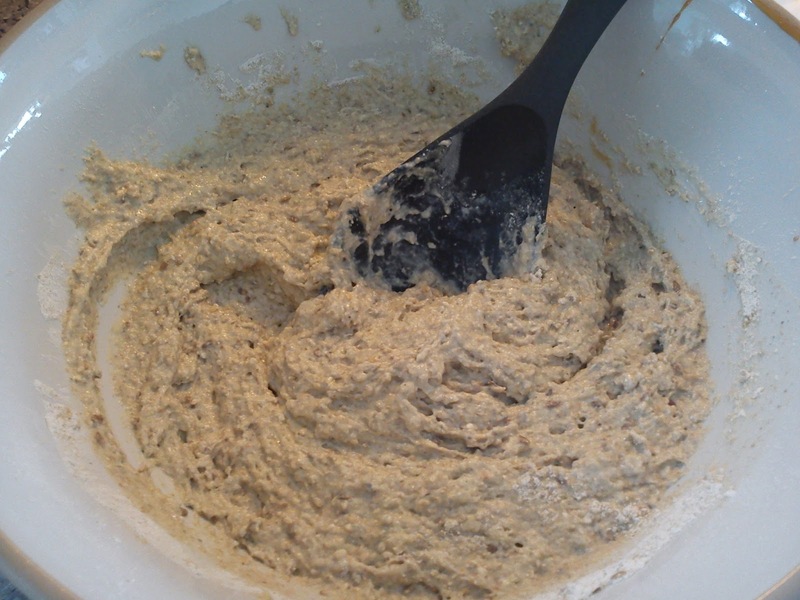 Mix 200 g wheat flour, sugar, yeast and milk together. Let the mix rest for 30 minutes on the kitchen table. Stir the melted butter and egg into the dough. 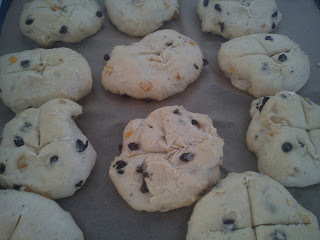 Add the salt, cinnamon, nutmeg, currants/raisins and candied orange peel into the dough. Add the rest of the wheat flour into dough. Knead the dough, until it is soft and smooth. 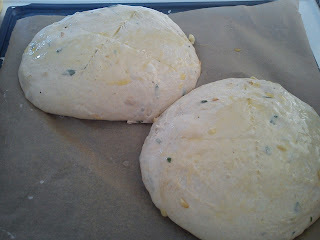 Cover the dough with a tea towel, and let the buns raises for approx 1 hours. Heat the oven (conventional) oven t0 200'C. Cur a cross into each bun. Bake the buns at 200'C for approx 20 minutes in the upper part of the oven. Mix the boiling water and sugar together. Glaze the baked buns, while they are still warm with this sugar water. 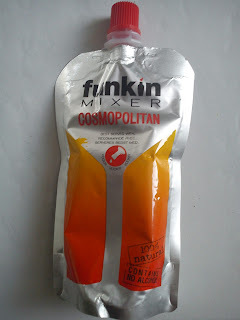 I have found some ready-to-use cocktails mixes in my local supermarket as a special offer. 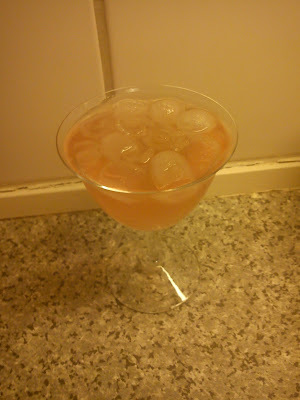 And I decided to buy one of each cocktail mixes, so I can compare it against a home-made version of a similar cocktail. Each ready-to-use cocktail costed 10 DKK/mix, which is giving one cocktail each. 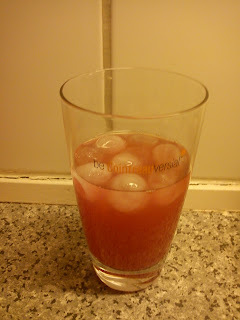 I decided to start of with Cosmopolitan, as I had some cranberry juice available in my refrigerator. The ready-to-use cocktail for a Cosmopolitan needed addition of vodka. And it had a more red colour compared to my home-made version of Cosmopolitan. The taste profile of the ready-to-use Cosmopolitan drink was actually quiet good, not being chemical or synthetic at all. Pour all the ingredients into a shaker containing ice cubes. Shake well. 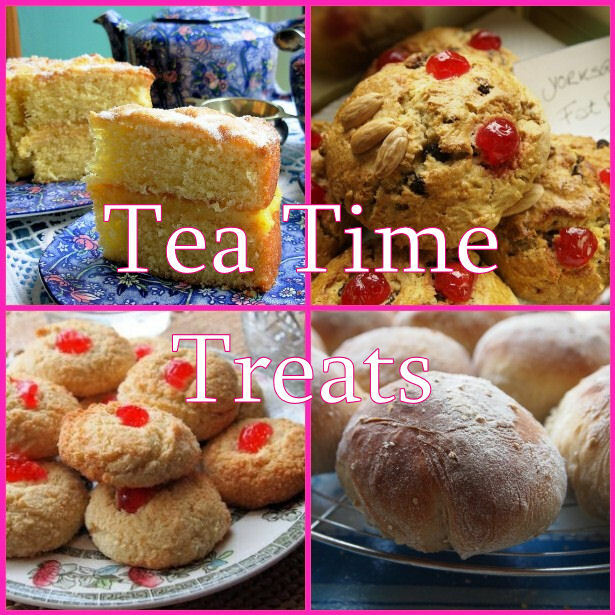 So we got Easter started yesterday with a a cup of tea, so for today being Good Friday we should be ready to make some Easter egg !!! Last year I made these Easter egg with nougat and liquorice, which I thought was lacking quiet a lot of liquorice taste (being a liquorice addicted Dane), so this I have increased the liquorice amount significantly and at the same time been using a combination of two liquorice powders (raw liquorice and English liquorice). 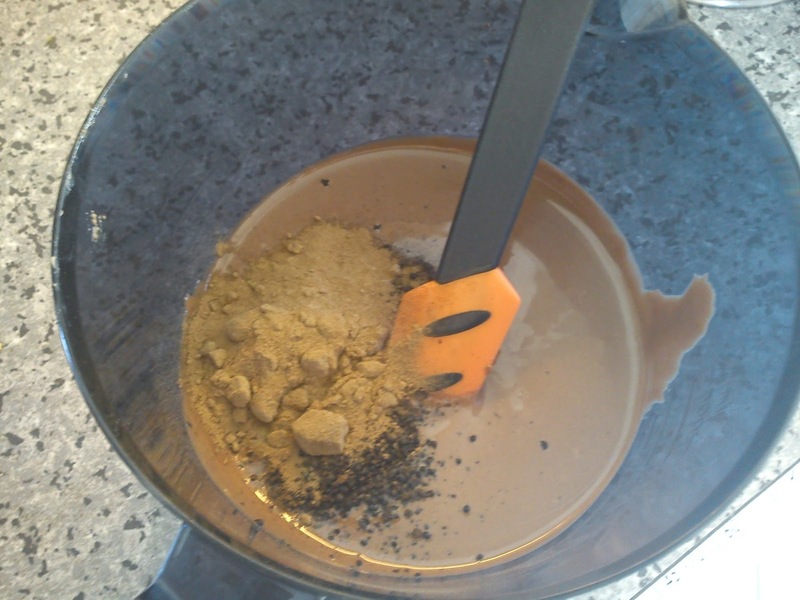 Stir the English liquorice powder and raw liquorice powder into the nougat. 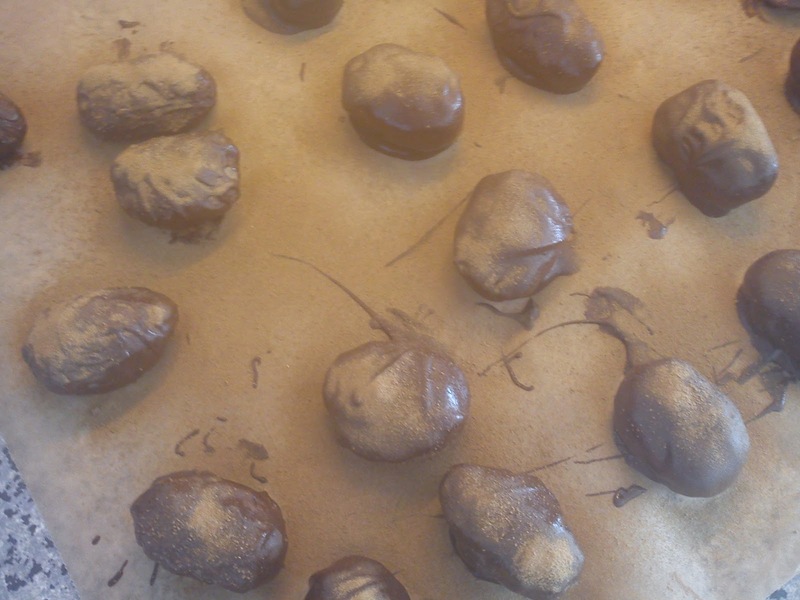 Dust the chocolate coating with English liquorice powder, lets them dry before you place the marzipan eggs in tin(s). 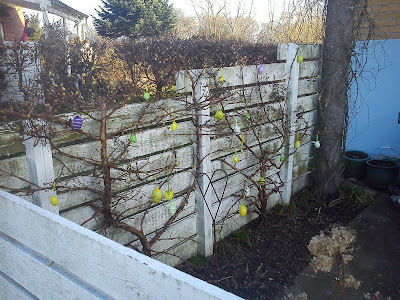 Today it is Maundy Thursday, which is an official holiday here in Denmark, and the very beginning of the Easter holiday, juhuu - as the next working day in Tuesday the 2 April, so 5 holiday days are in upfront of us Danes right here and now. 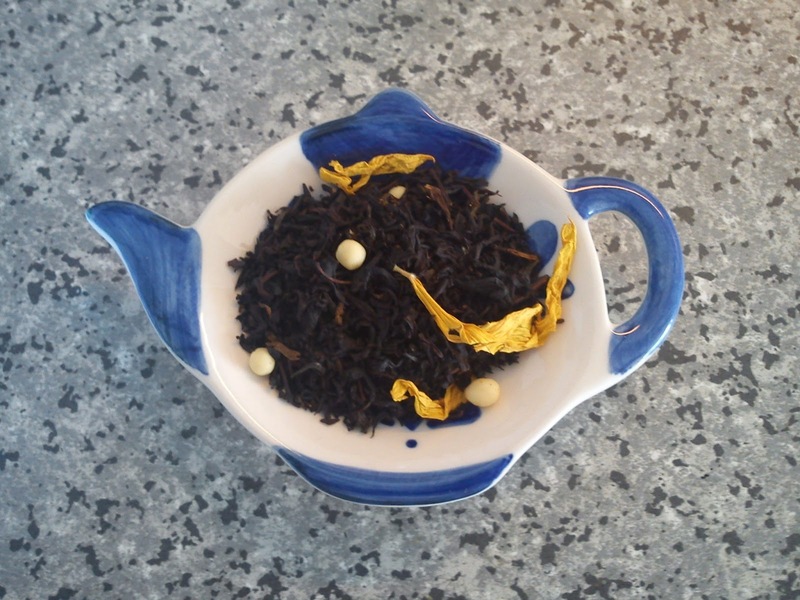 As for the Easter holiday I have bought an Easter tea, which is a mix of black tea with addition of white chocolate pearls, marigold and aroma. When ever you take the lid of the tea storage container, the aroma surrounds you and your nose being very overpowering. 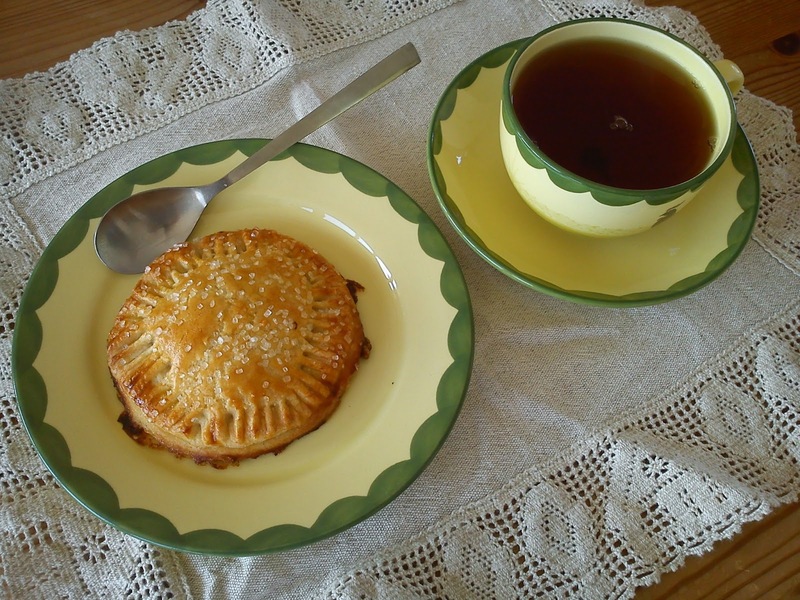 The taste of the tea is also very sweet, and you can see a floating fat layer on top of the tea, coming from the melted white chocolate. 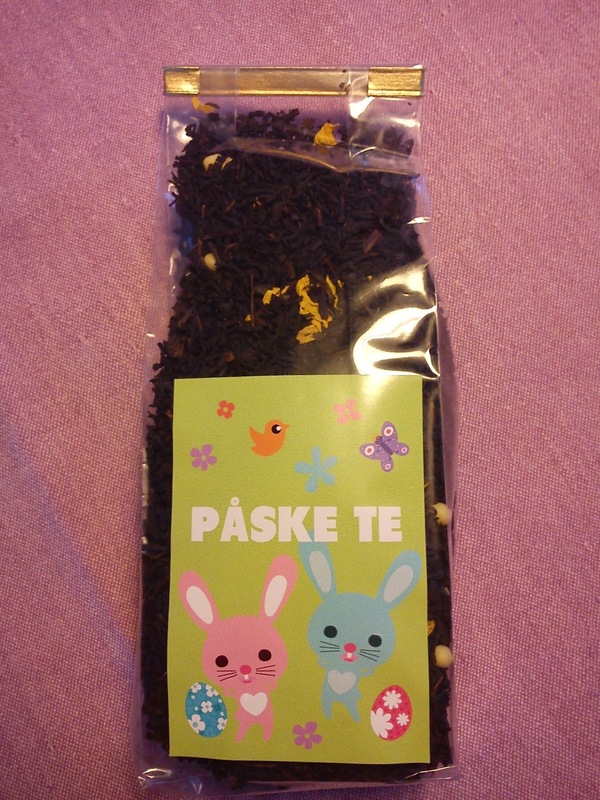 It is both the first, last and the final time, which I will buy this specific Easter tea, as it is too sweet for my tea palate combined with an overwhelming nauseous aroma. If you are on the outlook for a fantastic tea for your tea cup you should try to get hold of this Easter tea from Frere Mariage. I will be back tomorrow with a suggestion on, what you can do in your kitchen. 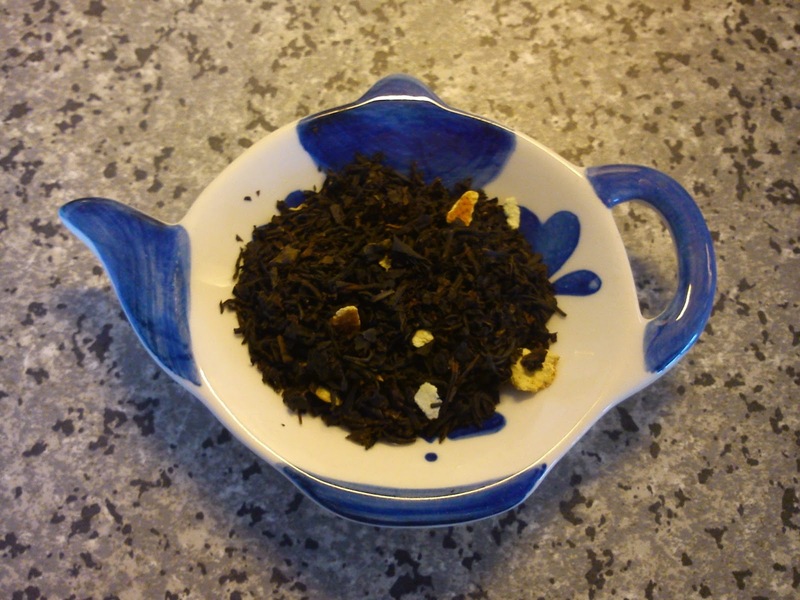 During a visit to my local tea pusher Luka Vejle I was introduced to a new Earl Grey from Chaplon, which was recommended to me being a keen Earl Grey tea drinker. 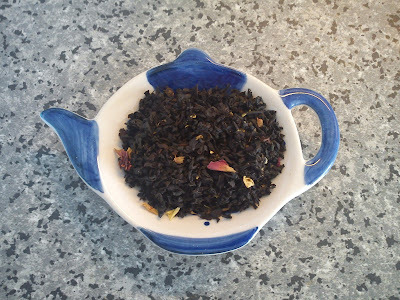 It is a good Earl Grey tea with a great look and sweeter taste profile. However, I must admit, that my taste palate is more towards Earl Greys with extra citrus notes in form of orange, lemon, lime and mandarine. 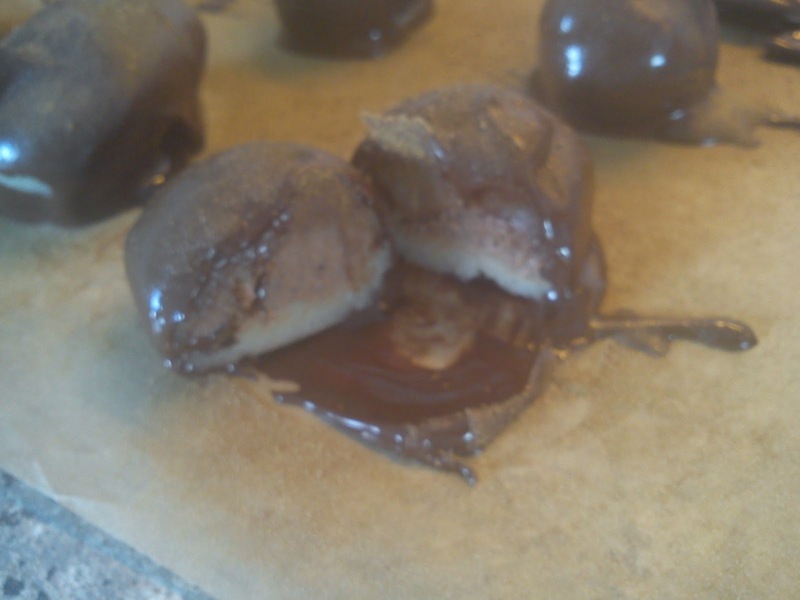 This is an very, very easy dessert to make, which does not require any baking or freezing. You would need to make some apple mash/compote in advance (where the apple preparation is quiet time consuming), but when it an easy and fast dessert to do. 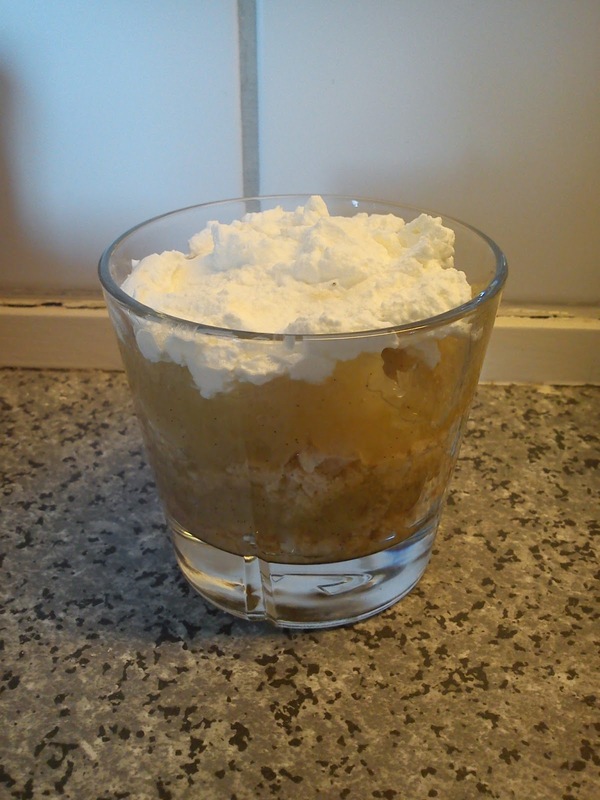 I normally serve this apple trifle in cocktail glasses as single servings. Afterwards fill apple mash/compote on top, approx half the glass should be filled. 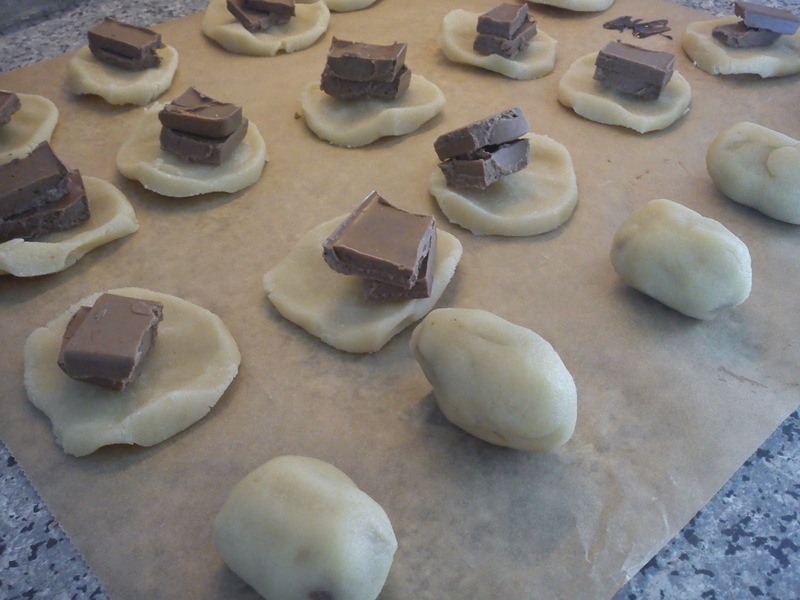 Filling a second layer of crushed macaroons on top. Followed by a second layer of apple mash/compote. The last finishing touch is a top layer of whipped dairy cream. The dessert is ready to be served. 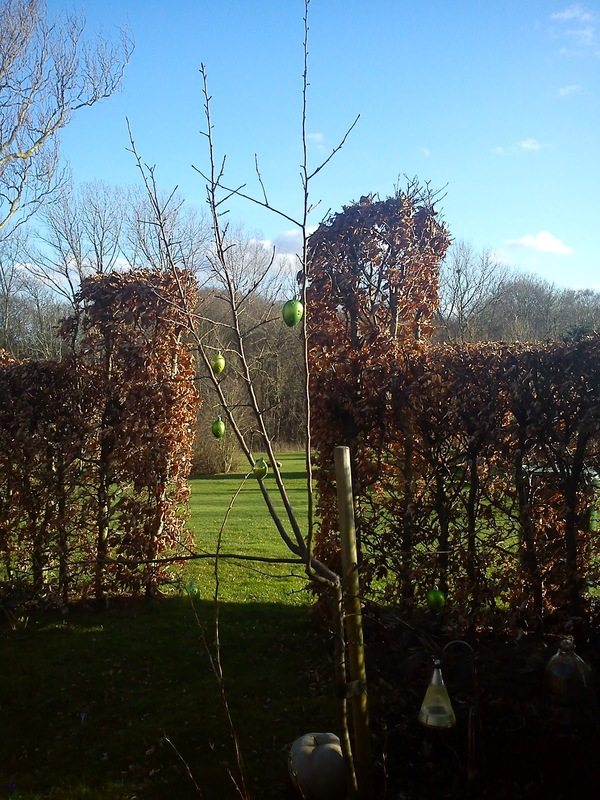 Today it is Palm Sunday, which is the start on Easter week and at the same time big vacation here in Denmark, as we Danes are having Thursday to Monday off from work. The Easter of 2013 is located in the very end of March month, which this year is quiet cold and dominated by snow. 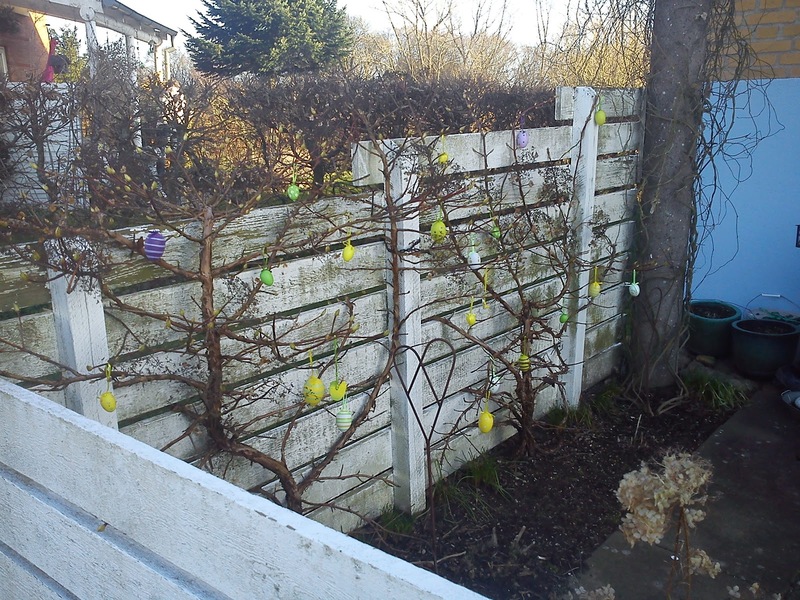 So this year Easter will be spend inside instead of outside in the garden digging and cutting as the first garden work, so I have no even decorated any Easter trees in my garden. In case you are on the look out for ideas for various kitchen creations, I am sharing a few Easter related food stuff. 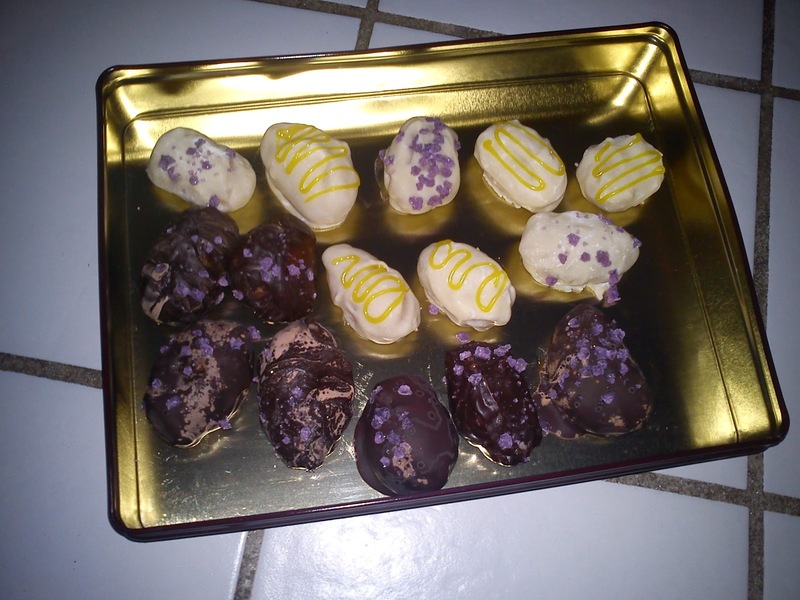 Easter egg with nougat and liquorice (dark chocolate eggs) and Easter egg with elder flower (white chocolate eggs). 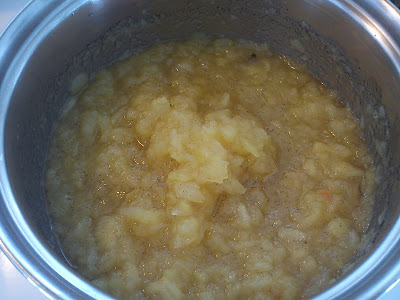 Apple mash or apple compote is something, which is very easy to make. The thing taking time making apple compote is actually the removal of core and peel from the apples followed by dicing the apple slices. You can adjust the sweetness of the apple mash/compote by adding less or more sugar depending on the desired sweetness for the final use. 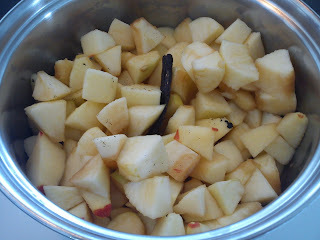 Heat up and cook until the apple pieces are soft, between 10-15 minutes depending on the firmness/softness of the apples. 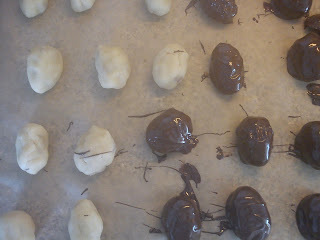 ﻿Late back from work due to a de-tour around my hairdresser, I need something, which was easy to prepare in my kitchen. 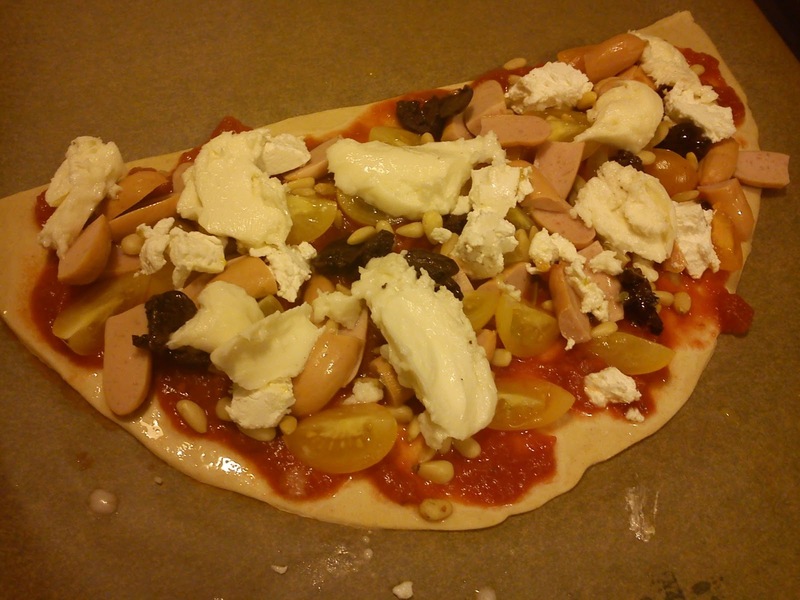 So this evening I made pizza using a ready-to-use whole grain pizza dough, ready-to-use tomato sauce spiced with rosemary, cocktail sausages, small yellow cherry tomatoes, black olives, pine kernels, goat cheese and fresh mozzarella. 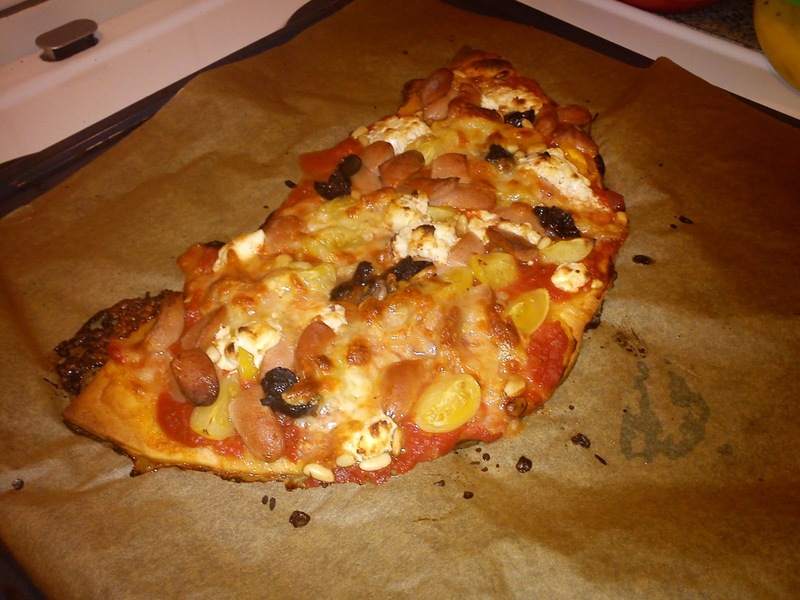 Another option could have been to make pizza with asparagus, pine kernel and goat cheese. 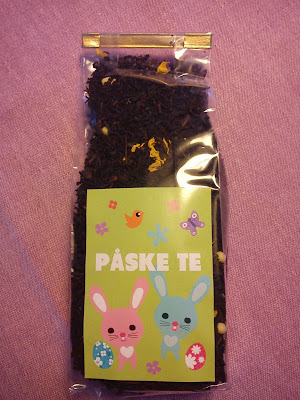 In connection with a fair in my local town I brought two different black tea from Thehuset Andersen. The first tea being liquorice tea I have tried before, so I knew at once, that I wanted a new portion of it, as it has a great taste of liquorice. And it is still one of my favourite teas. 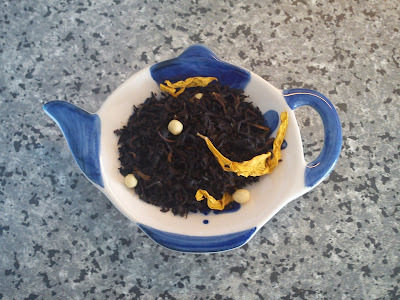 The second tea was Winter tea based on black tea containing orange peels, cinnamon, cloves, juniper and flavour. And it was another very good tea being spices in taste without being like a Christmas Tea. It is always with great excitement, that I check out the monthly theme for the blog event Tea Time Treat, which is hosted by Karen from Lavender and Lovage and Kate from What Kate Baked. 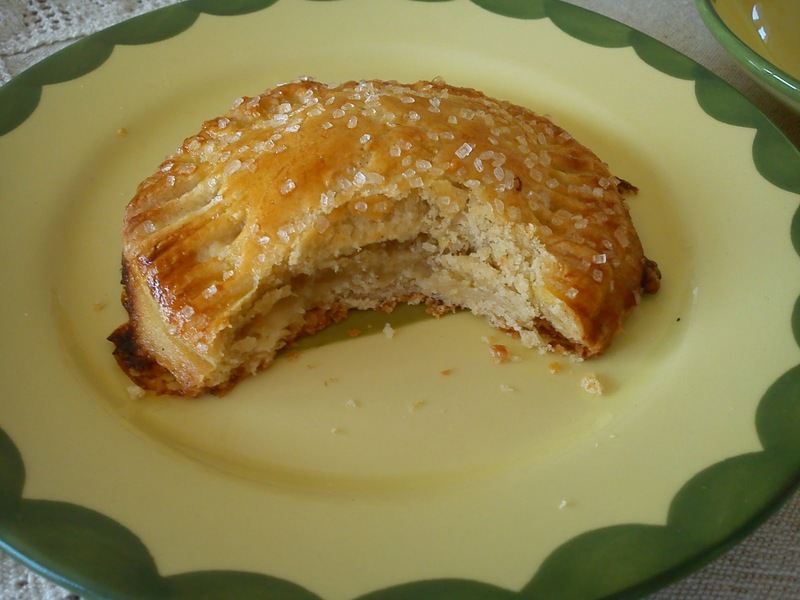 Here in March it is Karen from Lavender and Lovage, who is the virtual hostess for the monthly blogging event, which is having focus on French tarts, cakes, bakes and pastries. I have been wondering, what I should bake for this theme of French style cakes !!!! I am a great fan of macaroons, but after I have brogth a specific book on this topic, I have realised, that I am lacking some important kitchen equipment in form of kitchen mixer, as you apparently need to whip the macaroon dough for 15 minutes !!!!!!! Another option would have been to bake some Madeleine's, but then I found a recipe on Tartes aux Pommes in the baking book "Hjemmebagt", which could serve as "two birds with one stone", managing one more recipe on my task baking all the recipes in this bread and at the same time to participate in this virtual tea time table. Crumble the cold butter pieces and flour together. Stir the yeast and sugar into the whipping cream, until the yeast is dissolved. Add this whipping cream into the flour, and knead the dough fast together, until it is smooth. Store the dough cold for 30 minutes. Roll the dough out and cut out 18 circle pieces with a diameter of 8 cm. 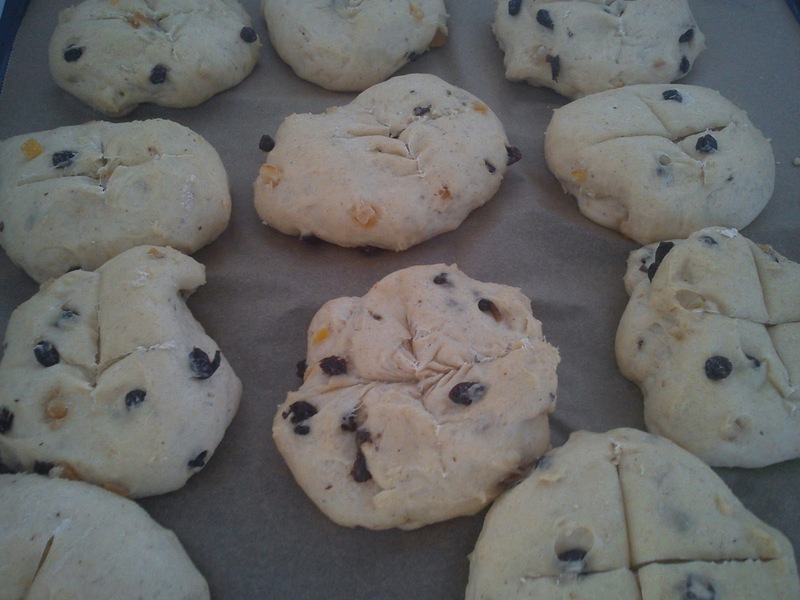 Place 9 circles on the baking tray covered with baking paper. Place the apple compote in the middle of these circles. Brush the dough circle outside the apple compote. Place the remaining the dough circles on top of the apple compote circles. The edges are pressed together with a fork. 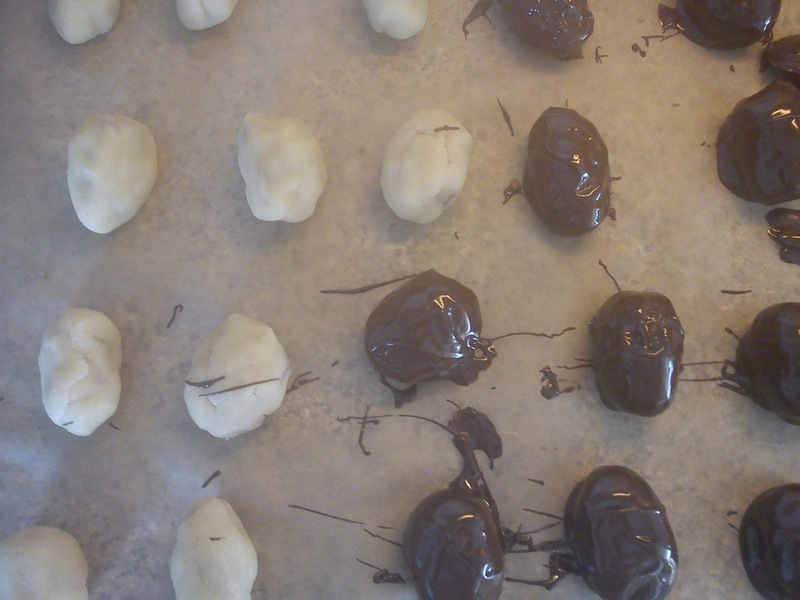 Afterwards the dough is brush with whipped egg and sprinkled with pearl sugar. 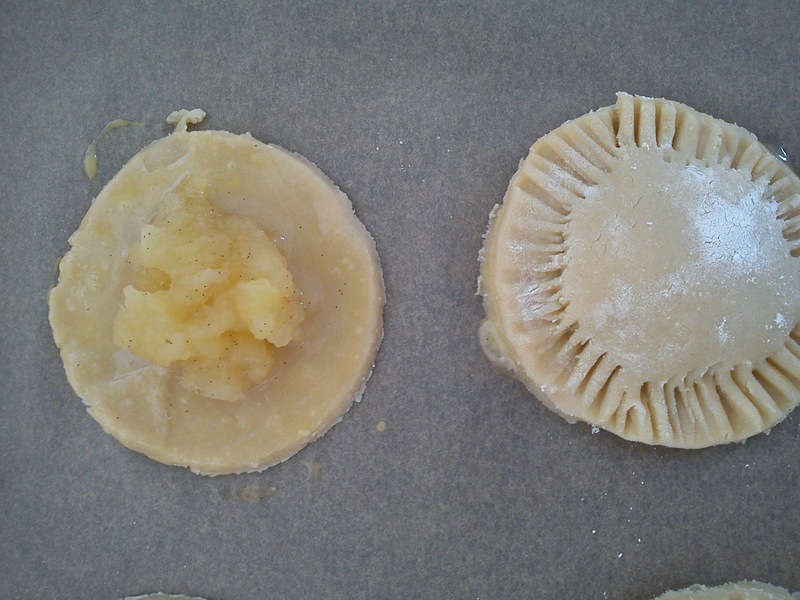 Bake the apple tarts at 220'C in the middle of the oven for 12 minutes. Further progress my way through the bread bread "Hjemmebagt", and with this Rosmarinbrød (rosemary bread) I have baked 9 different recipes already in 2013, which is an amazing high number compared to 2012, where I only managed to bake 6 recipes in total. This time it was the bread called rosemary bread, which is a bread made first from a pre-dough, which when is used to make the final bread dough 14-16 hours later on from wheat flour, yeast, salt, water, olive oil, mashed potatoes, pepper, rosemary and 50 g roasted roughly chopped garlic. So a more correct name for this bread would have been garlic bread with a touch of rosemary. 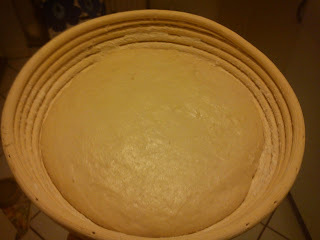 I have been baking a lot of bread raised with yeast and without the use of a pre-dough being mixed into the final dough. 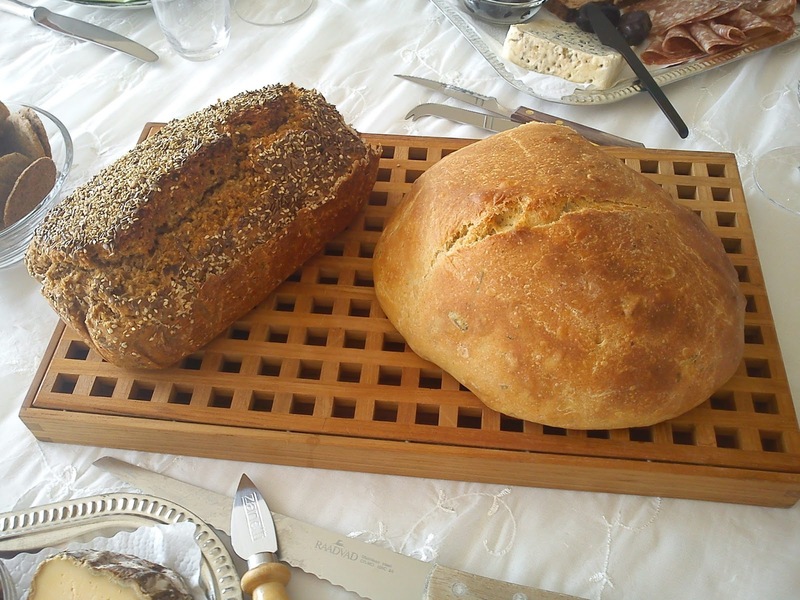 And an entire chapter in the bread book called "Hjemmebagt" is dedicated to the making and baking of rye bread using sour dough. However, these sour doughs I find a little bit "scary", as I have never created my own sour dough and baking with a sour dough. But in rye bread you have to work with sour doughs !!!! and therefore I have not ventured into this specific chapter in my bread book. 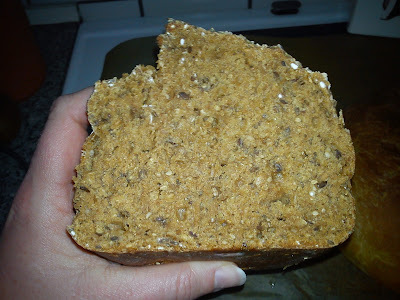 However, in another chapter having focused on baking powder I have found a recipe on rye bread called Hurtigt rugbrød (fast rye bread), where you do not have make a sour dough first. 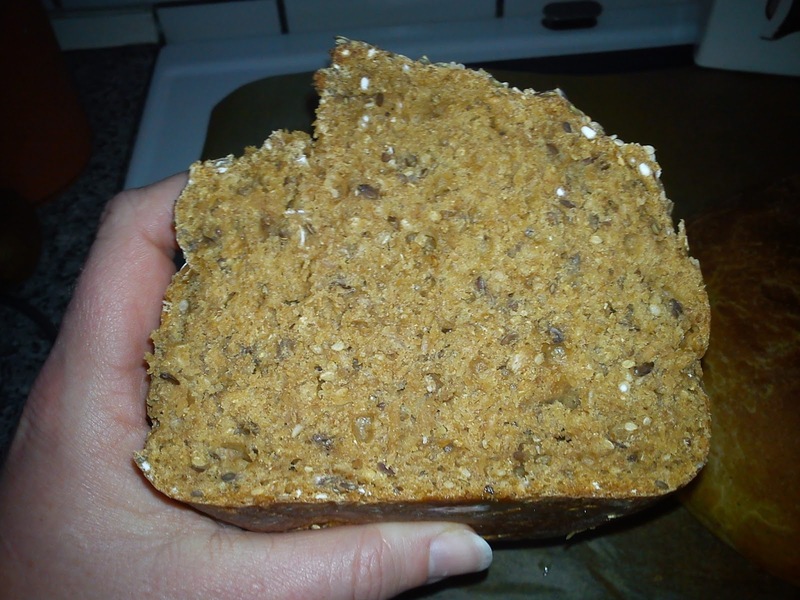 I so decided to bake this rye bread, which it the very first rye bread, which I have ever baked. And it is very simple, you just mix various flour types together (wheat and rye, fine sieved and whole grain types of both) together with linseed, sesame seeds, buttermilk, water, salt, malt syrup and baking powder. Place the dough in a bread form and bake it for approx 1½ hour. So now I have taken my first very little step towards baking a rye bread with sour dough. It is just a question of splitting the entire elephant up in smaller bites, so you can eat the entire animal, small bite by small bite. As a "thank you" to my fellow rowers for rowing together with me during the season of 2012, so I managed to cross the magic figure of 1500 km required for a "Gold Ore" (actual I rowed 1764 km in 2012, which is the highest number of km, which I have ever rowed in a season), I decided to invite the rowers, who have spend most time together with me in the rowing boat, for lunch today. Actually if you estimate, that you row 6 km per hour - 1764 km equals 294 hours of rowing last season or 12 days and 6 hours. 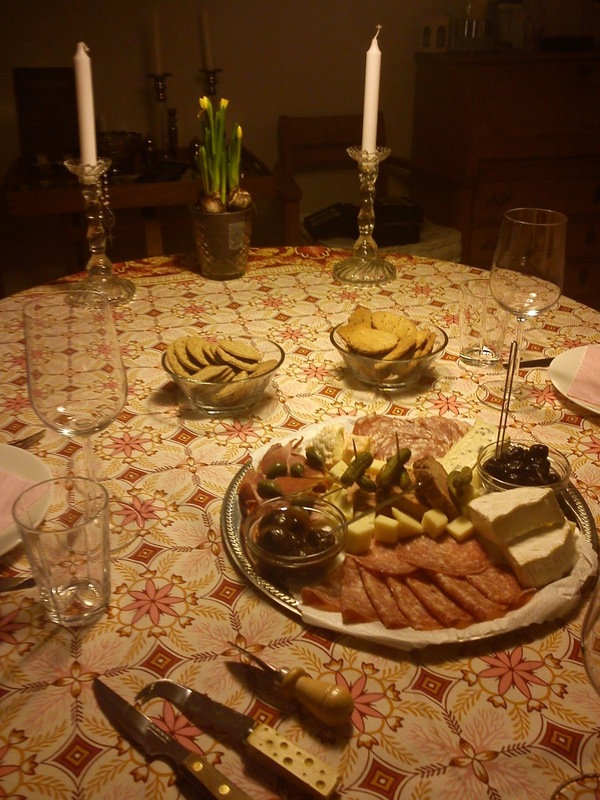 As for the "Silver Ore" lunch last year I contacted my local "cheese pusher" (Osteriet) for make both a cheese as well as sausages selection, so I could spend yet some more "quality time" baking more of the recipes in the bread book "Hjemmebagt". I decided to bake the very first rye bread, which I have ever baked myself, in form of a fast rye bread (Hurtigt-rugbrød), raised with baking powder instead of the usual sour dough. 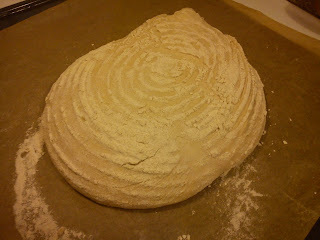 And as the white bread I baked a bread called Rosmarinbrød (rosemary bread). Besides from bread I also served two different types of home-made biscuits (rye biscuits with cumin and Digestive biscuits). 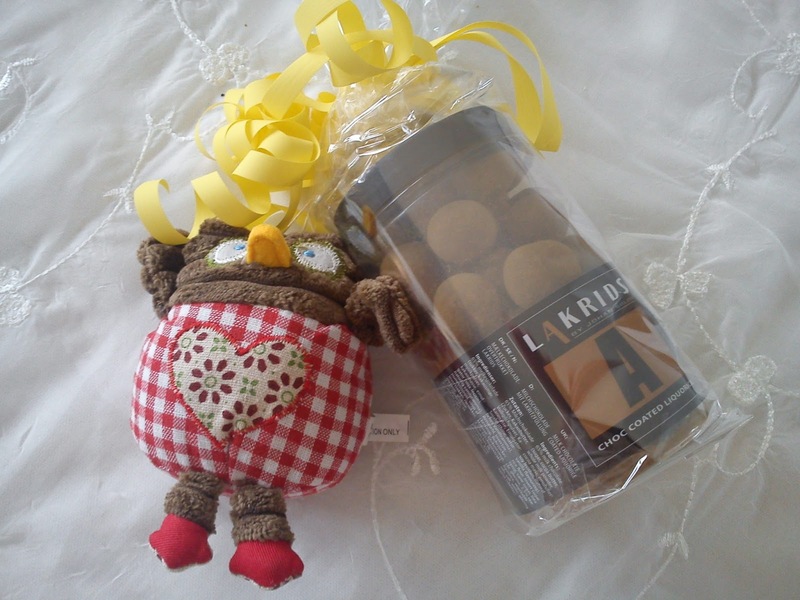 My fellow rowers know too well, as I got a big glass of liquorice coated in chocolate and roll in liquorice powder together with a wise owl as hostess gift. After drying the table cloth used for the lunch outside, I took it in-side to drying it for the last damp. 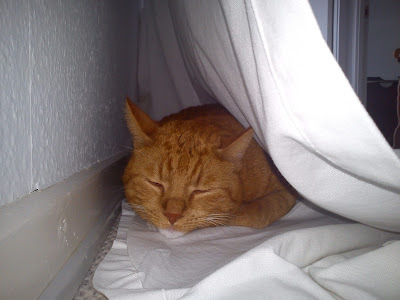 And here Hannibal the Cat has a funny habit, that he wants to make a cave for sleeping in-side. So sometimes, when I get home from work, I can find all my dry washing laying on the flour, after Hannibal the Cat afternoon nap. Hannibal the Cat sound asleep in his cave of table cloth. Some weeks ago I found a recipe on lemonade made from clementines and bergamot in the weekly newsletter issue 6/2013, so when I located a bergamot in my weekly vegetable box, I knew at once, that I wanted to make lemonade. 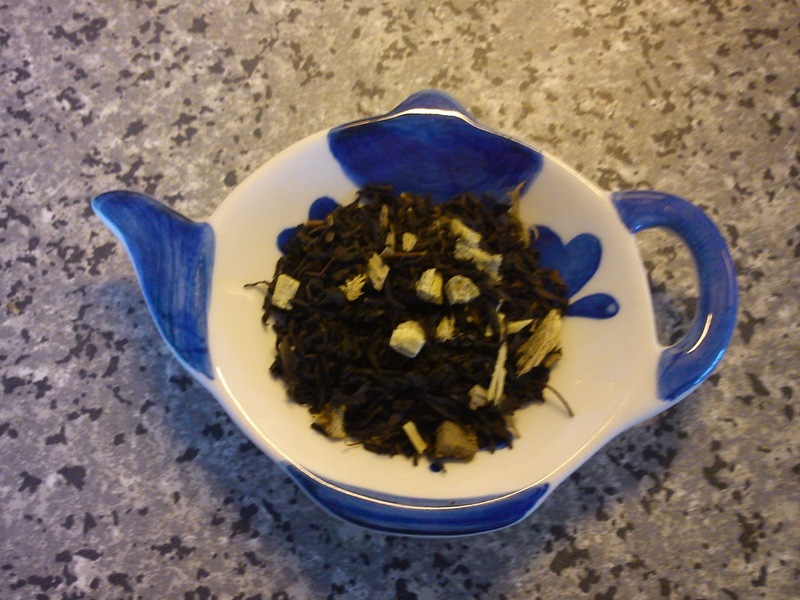 The peel of the bergamot has a lovely flavour of bergamot, which I recognise from Earl Grey tea. 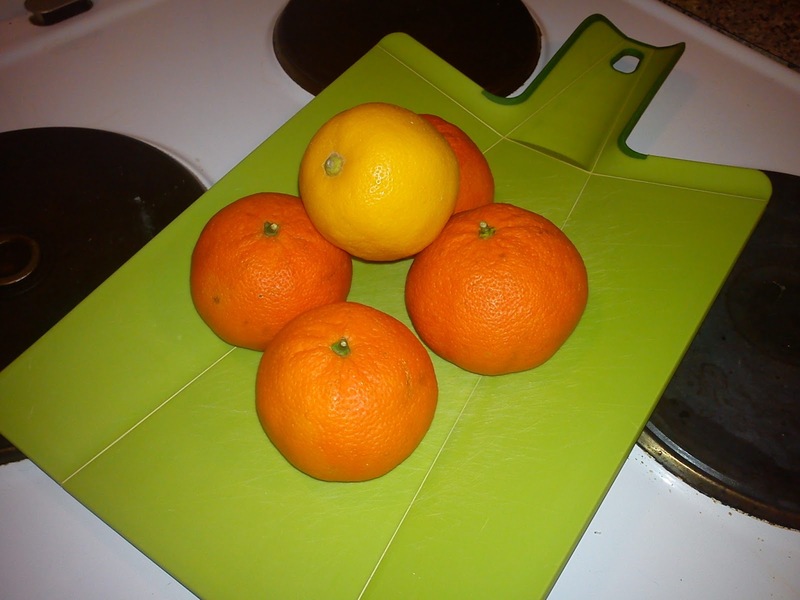 However, the in-side of the bergamote taste of a normal lemon. 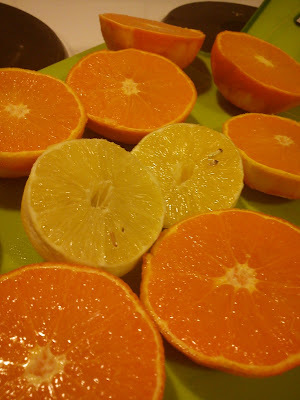 This lemonade is a wonderful combination of sweetness and flavour of the clementines with freshness from the bergamote. Bergamot can also be turned into bergamot-orange jam. Peel the clementines (½ of the fruits) and bergamot with potato peeler, avoid to have to much of the white part of the peel. Squeeze all the citrus fruits and add the juice into a small cooking pot together with all the peels. Add sugar and water into the cooking pot as well. You can increase the sugar amount, if you want more sweetness in your lemonade. 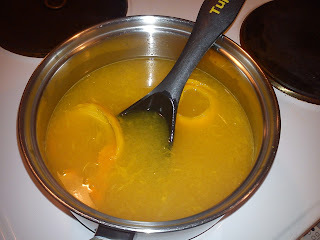 Cook the lemonade up to the boiling point and let it simmer for 5 minutes. Keep a lid on the cooking pot, so you maintain as much flavour in the lemonade as possible. After 5 minutes cooking, remove the cooking pot from the stove and let it rest for another 15 minutes. Pass the lemonade through a sieve and fill into storage bottles. 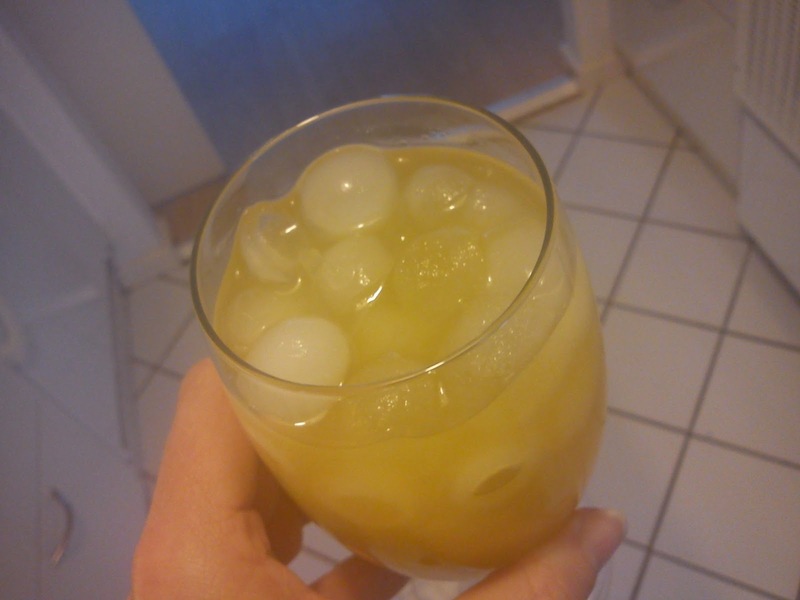 Serve the lemonade with plenty of ice cubes. 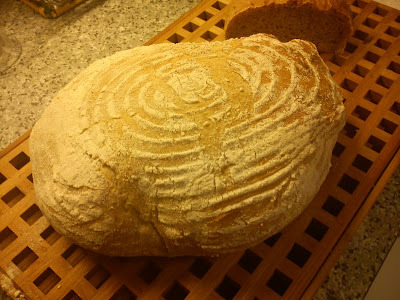 I was baking again last week-end, taking another small step towards baking my way through the great bread book called "Hjemmebagt". 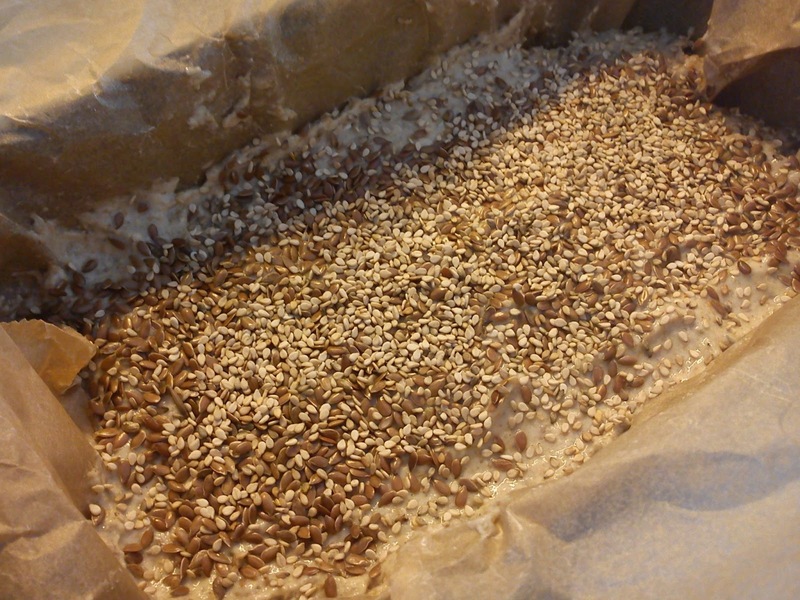 This time I decided to bake the very, very first recipe in book called "Det basale brød (the basic bread)". And as the recipe name indicated is a simple bread made from flour, water, yeast and salt, so no use of fancy flours nor ingredients. 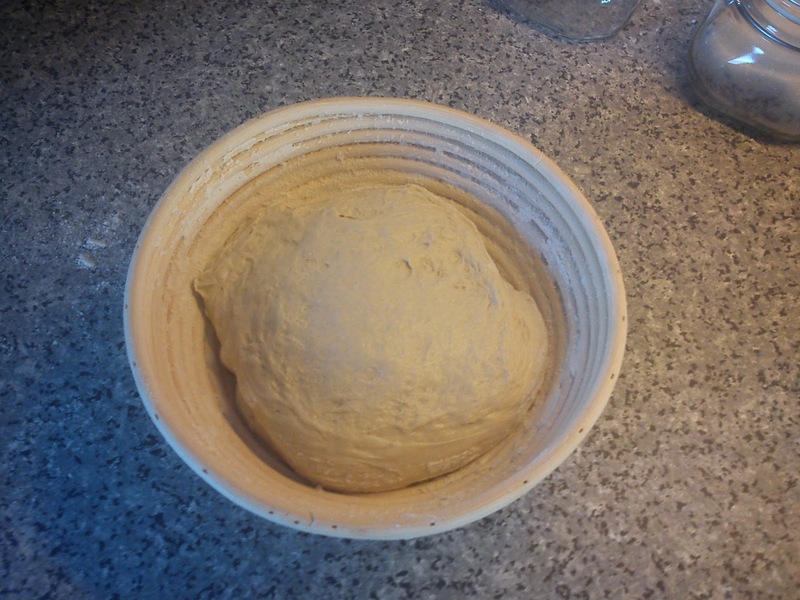 The bread can be baked from either spelt flour or wheat flour. 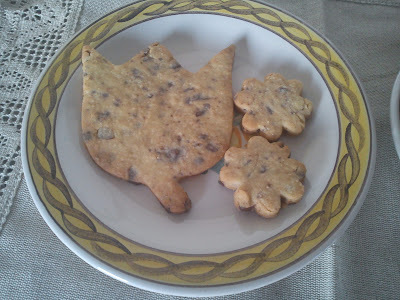 I wanted to bake it from spelt, but I did not have enough spelt flour, so I ended up with a combination of 75% spelt flour and 25% wheat flour. I made another modification to the bread process. As I needed to have the bread ready for some guests coming around in the evening, it would be a little tricky to raising the bread twice between returning from work and serving the bread for the guests. So I made the dough the evening before, followed by cold raising cold outside and afterwards followed by raising at ambient temperature in a bread basket, after I return home. The tricky thing about raising bread in a bread basket is to cover the basket with enough flour, so the dough is not sticking to the basket, when you place the dough on the baking tray. Inviting guests around for dinner on Friday evening after a full working week, can easily demand too much of a work effort: driving home from work on the motorway full of digestions hurdles, cook dinner and make an inviting table before guests are knocking on the door !!!! You easily end up being stress and are not able to relax and enjoy the good company of your friends. And therefore you decide not to invite any guests at all. 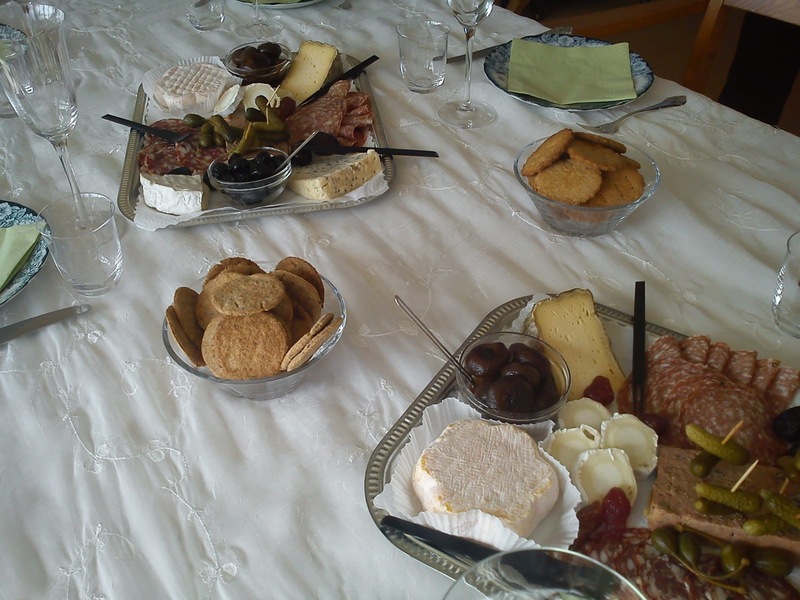 The solution for me is to contact my local "cheese pusher", where I collect some excellent cheese tapas from Osteriet, Vejle. And as preparation the evening before I make a bread dough, which can raise cold either outside or in the refrigerator, followed by raising at ambient temperature, after I return home and bake the bread approx 30-45 minutes, before the guests should arrive. 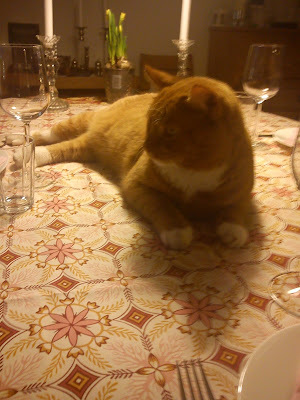 Laying the table is quiet often seen as an invitation for Hannibal the Cat to show him self off, as he will lay in full body in the table cloth, so the guests can praise him on his good look !!! Now I have managed to create/bake/make 1/3 of all the many excellent recipes in the bread book "Hjemmebagt", this feels quiet amazing !!!! I posted my very first blog post (Frederiksgårds frokostbrød) on November 20 2010, so almost 2 years and 3 months ago. 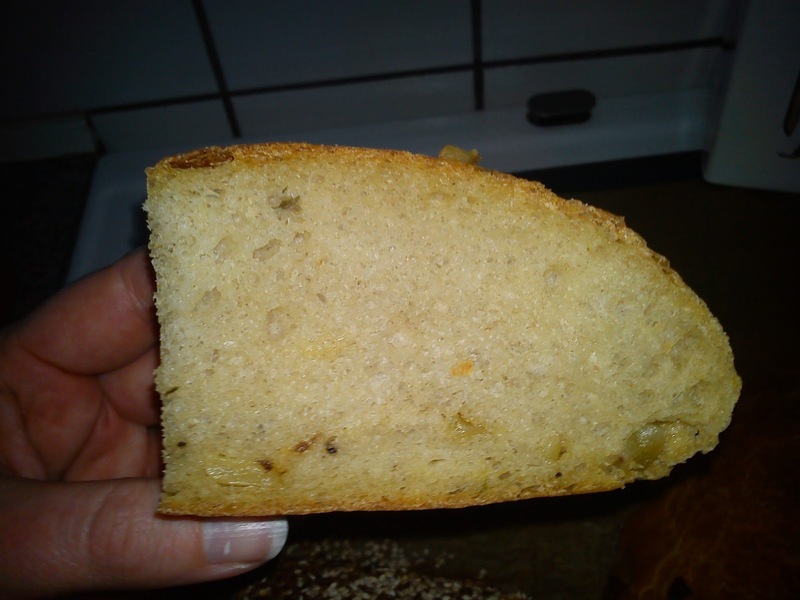 Sometimes I am in a "baking stream", where I managed to bake a new recipe on very regular intevals (right now I am in such a stream), followed by time, where the bread book collect (flour) dust on it´s shelf in the kitchen. 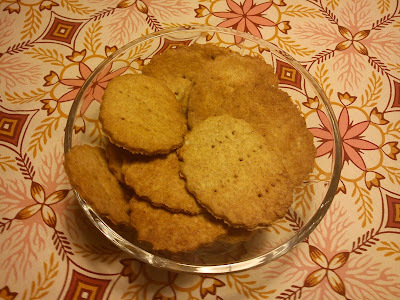 This time I have baked Digestive biscuits, which we sometimes pronounce with a Danish accent, which could be translated into "dike stiffener". It is the second time, I have been baking biscuits, and it is so much easier, than I was imageing before doing it. These Digestives are made from flour, butter, baking powder, salt and sugar, so some very basic and ready available ingredients found in most kitchens. Afterwards you can start to think how to twist this recipe with various spices or herbs bringing more interest into your kitchen life. Well, I think, that I will be looking into my bread book, so I keep up my great baking progress remaining in my "baking stream".